Will Matt be Bourne Again? 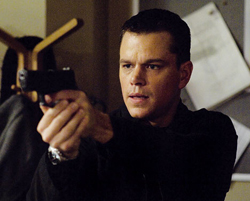 This is a story that has gotten kind of old but it appears that there’s a much better chance that Matt Damon and Paul Greengrass could be stepping back into the Bourne world in the not-too-distant future. Which would be cool, especially if they team Damon up with Jeremy Renner and bring unity to the franchise. Universal is in negotiations to bring the winning actor/director combination back, according to Twitch. That’s a good development since this is a franchise that has legs and has always stayed true to its model and not gotten silly or showy or with its eye off the creative ball. Though there was a disconnect between these two very talented men and former writer/director of the fourth film Tony Gilroy it seems everything works best if the stronger and more marketable Damon fueled version of the franchise does its part to keep the series rolling as Universal plans to continue the Renner version rolling. This is all speculative. In Hollywood a misinterpreted script note can lead to discord, let alone very busy and expensive talents aligning with a very busy studio. Fingers are crossed. Then again my favorite film in the series was the Renner incarnation so take my words salt grain infused.